Brain Informatics (BI) is an international, peer-reviewed, interdisciplinary open-access journal published under the brand SpringerOpen, which provides a unique platform for researchers and practitioners to disseminate original research on computational technologies related to the human brain and cognition. This journal will publish high-quality original research papers, brief reports and critical reviews in all theoretical, technological, clinical and interdisciplinary studies that make up the field of brain informatics and its applications in brain-inspired intelligent systems, health studies, etc. 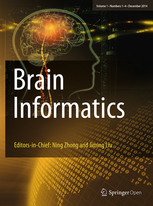 The Brain Informatics journal addresses the computational, cognitive, physiological, biological, physical, ecological and social perspectives of brain informatics, as well as topics relating to mental health and well-being. It also welcomes emerging information technologies, including but not limited to Internet/Web of Things (IoT/WoT), cloud computing, big data analytics and interactive knowledge discovery related to brain research. The journal also encourages submissions that explore how advanced computing technologies are applied to and make a difference in various large-scale brain studies and their applications. Informatics-enabled studies are transforming brain science. New methodologies enhance human interpretive powers when dealing with big data sets increasingly derived from advanced neuro-imaging technologies, including fMRI, PET, MEG, EEG and fNIRS, as well as from other sources like eye-tracking and from wearable, portable, micro and nano devices. New experimental methods, such as in toto imaging, deep tissue imaging, opto-genetics and dense-electrode recording are generating massive amounts of brain data at very fine spatial and temporal resolutions. These technologies allow measuring, modeling, managing and mining of multiple forms of big brain data. Brain informatics techniques for analyzing all the data will help achieve a better understanding of human thought, memory, learning, decision-making, emotion, consciousness and social behaviors. These methods also assist in building brain-inspired, human-level wisdom-computing paradigms and technologies, improving the treatment efficacy of mental health and brain disorders. This is an open access journal, which is freely accessible online to anyone, anywhere. The open access fees (article-processing charges) are fully sponsored. Authors can publish in the journal without any additional charges.